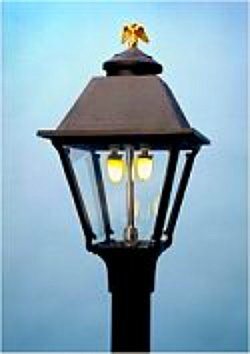 Outdoor gas lighting, while not practical for many outdoor applications, is a great lighting option that is often overlooked. Obviously, this isn't the best way to provide landscape lighting, but it is a great way to provide ambient light for your quieter, more relaxing outdoor activities. 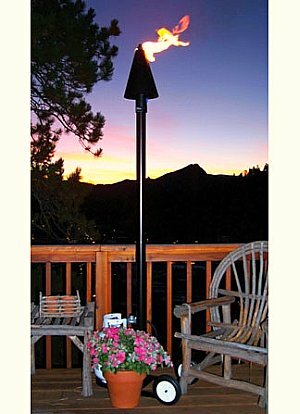 Gas torches set around a deck or a patio can offer a charm and warmth unmatched by any other lighting option. 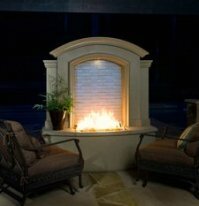 Think of the ambiance provided by open flame lighting around a pool or a hot tub. 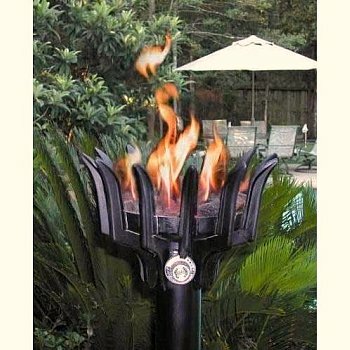 Gas torches, also referred to as tiki torches, can be fueled by natural gas or by propane. Models are available with electronic ignition, so they can be turned on from inside the house. Of course, if you want that option, an electric source has to be provided, as well as the gas source. You can even get photo cells or timers included for automated on / off ease of operation. Other models need to be lit at the light itself, which is a simple chore. There are two forms of gas lighting - the open flame design and the design with a mantle, similar to a camping lantern. The open flame can be inside a glass enclosure for a lantern style light, or it can be out in the open - more in a torch style. The open, flickering flame design has the market cornered as far as charm and mood lighting goes. But it doesn't offer much other than that. Gas lanterns with mantles may not provide the ambiance of their open flame cousins, but they do offer the advantages of adjustability - from low level background lighting to high intensity "light up the yard" brightness. Most of the designs discussed are available in either fixed or portable versions. If you need portability in an outdoor gas lighting design, forget natural gas. Propane tanks will have to be utilized to fuel the portable models. 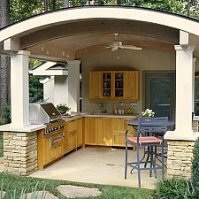 Most are designed to use the standard 20 pound tanks commonly used with gas grills. Keep that expense in mind when budgeting for your outdoor lighting needs. 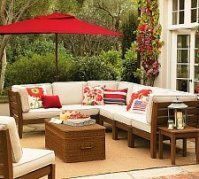 You will have to overcome the presence of the tank in order to keep it from being disruptive to the appearance of the rest of your carefully designed outdoor living area. Planters, tables, or other furniture can shield the tank from the view of your guests. Some outdoor gas lighting models are available that use the smaller one pound propane cylinders. These are inexpensive disposable fuel canisters commonly used with camping stoves and lanterns. They obviously don't last as long as the larger tanks, but they are much easier to hide. One canister typically lasts a few hours, so most evening activities will only need one cylinder.